Chelsea kept pace with the leading pack in the Premier League as they moved into fourth place with an impressive win at Southampton. The Blues took the lead when Eden Hazard capitalised on poor marking before cutting inside Steven Davis and powering a shot through the legs of keeper Fraser Forster. 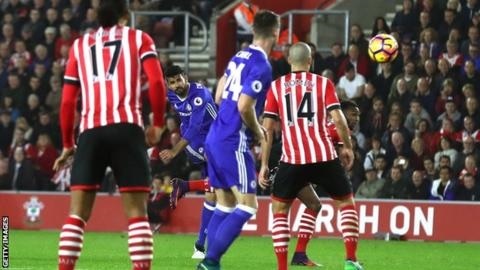 Southampton had plenty of the ball but could not find a way through a well-drilled Chelsea, who looked the more threatening and went close when strikes from Hazard and Diego Costa were saved. Costa, however, beat Forster at full stretch with a wonderful curled effort from 22 yards. Victory was Chelsea's fourth in a row in the league - a feat they last achieved in April 2015 - and put them one point behind Manchester City, Arsenal and Liverpool.